With WeTransfer Plus, you can set up your own WeTransfer channel, which will have a unique URL that you can customize (such as “myname.wetransfer.com”). Also, you can specify your own wallpapers that display when others download files from you or use your channel to transfer files. Why would you want to do this? Say you regularly use your Plus account to send files to business clients, and you want to promote certain services to them. When your clients download your files, or they use your URL to send their own files, they see your promotional backgrounds. Keep in mind that anyone can use your channel to send files. That’s right, even people you don’t know, if they get a hold of your URL. However, they can’t access your account, and they can send only 2GB, just like with the free service, while you can send up to 10GB. This probably isn’t a big deal; you just need to be aware, because you can’t see what files they’re using your URL to transfer. The good thing is, if they use your channel, they see your custom wallpapers! Log in to your WeTransfer Plus account with the e-mail address and password you registered with. Click the Plus tab to the left of the Send Up to 10GB dialogue box. You see the Edit screen in Figure 1. 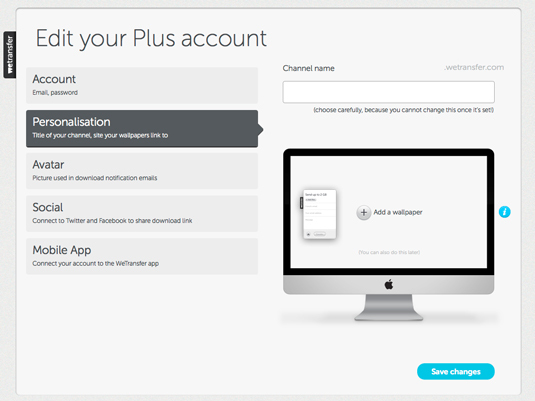 Figure 1: Set up your WeTransfer channel. The name of your channel is what goes before the “.wetransfer.com” part of your personalized channel URL — for example, “myname.wetransfer.com”. So, you want to make sure you choose this carefully, because you can’t change this later. (WeTransfer warns you of this, too!) If you’re using WeTransfer Plus for your business, the name of your business is probably the best choice. Remember, this appears as part of the official WeTransfer Plus URL that you give to other people, so choose something suitable. When you decide on a name, type it in the Channel Name box. It has to be unique; if someone else already has your channel name, you’ll be prompted to try a different one. When people come to your WeTransfer channel to download or send files, they can see the wallpapers (or backgrounds) that you specify. You can choose up to three different wallpapers. If you don’t specify any wallpapers, WeTransfer will display a simple dark gray background. So you might as well choose your own. WeTransfer recommends that you use the dimensions of 2560×1600 for your wallpapers. And your images can’t be more than 3MB. Log in to your WeTransfer Plus account and go to the Personalization tab, as described above. Where you see the computer monitor, click the plus sign. Navigate to the images you want to upload on your hard drive. You can choose only jpg, gif, or png files. Click Open. The image is uploaded and appears below the computer monitor as one of the three thumbnails, with an active check mark below it. To change an image, click on its thumbnail and choose a new image. If you want to deactivate one of the wallpapers, hover over the Active button, which changes to Deactivate, and click. If you want your images to link to another Web page, fill in the URL Wallpapers Link To field with the address of the page. There’s only one field, so all three wallpapers will link to the same page.